BOREDOM and peer pressure is what led to Melissa Caletti smoking cigarettes at the age 16, but it was a very serious realisation that made her put them down at the age of 48. 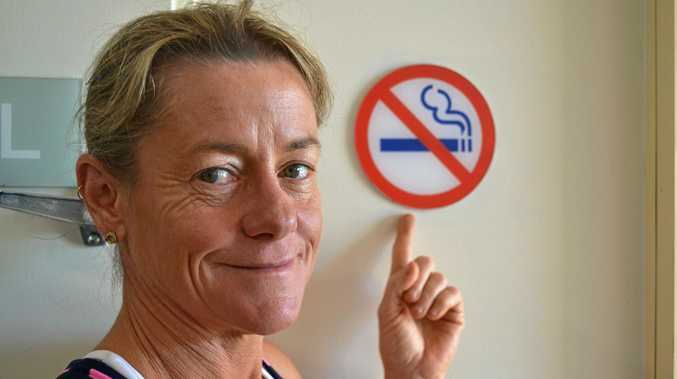 Mrs Caletti is now in her eighth year without touching a cigarette, a stark contrast from when she was a 50-a-day smoker. Her nicotine addiction was taking a huge toll on her life, not just physically but it was costing her upwards of $5000 a year. "It started when I was 16 years old living in Injune and I used to steal my mother's cigarettes and then once I finished school and was at the age where I could buy them I became a full-time smoker," Mrs Caletti said. "Up to 50 sometimes a day, put one out, light another one - I had a very bad cough and I couldn't walk up a flight of stairs. "I knew I had to stop, but the only reason I stopped really was because I was told that I was going to be a grandmother and I just said 'I need help'." Mrs Caletti's quitting success contributed to statistics in the Health of Queenslanders 2018 report, which revealed between 2009-2018 the number of adult smokers in the southwest fell by 14 per cent. While there has been a decrease in the number of adult daily smokers in the southwest, the rate of smoking is still 52 per cent higher than the Queensland average. "It can take an enormous amount of effort to quit and those who have should be congratulated," Queensland Health spokesperson said. "We want people to know there is help available. "No matter who you are, or how long you've been smoking, it's never too late to become healthier and happier without cigarettes." Smoking is the single largest cause of cancer in Australia and from experience, Mrs Caletti, said getting help is the best way to break the addiction. "I would have never been able to do it if I didn't ask for help," she said. "I had all the excuses that I couldn't give up smoking. "But you can't use that you're stressed as an excuse, you just have to decide to give up and get the help." with the doctor and since then her life couldn't be better. "Since quitting I have run a half marathon, I've done Spartans, I've rode to Wallumbilla and back, and I've travelled around the world, which I never thought would be possible." To quit, call 13QUIT (13 78 48).